Are you familiar with the cartoon show Madeleine? Years ago, when daughter was still a toddler, she loves to watch that show on Disney Channel. Maybe because she thinks she's Madeleine since both of them sports the same short hair and is surrounded by nuns. Well, Madeleine is surrounded by nuns while my daughter has an aunt nun! The gist of the story is that Madeleine live in the orphanage with other girls. The orphanage is being run by a nun. And almost every day, they all have nice adventures. And here's the story of the bread. Hubby arrived home today lugging a huge pack of loaf bread. He said it was given by a client after their meeting. Oh, okay --- bread?? Anyways, it was fresh from the oven (hubby said), and he even saw it coming out of the kitchen and being brought to the hotel's cafe. Anyways, the bread suddenly made me remember of a nice prayer from the cartoon show, Madeleine. A very nice but simple prayer for a child, and for all of us. I am thankful that I have my family close to me, and that we love each other dearly. I am thankful that we have bread on our table, and that even if lacking at certain times, we are able to share our bread with friends and neighbors, and other people. I am thankful for each single day, for the bright sun, the gentle rain, the night's embrace and the guiding stars. 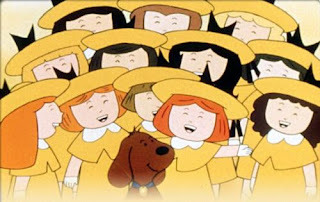 I remember si Miss Clavel!